The HTC U Ultra, which was unveiled last month, is now available for purchase in Europe. 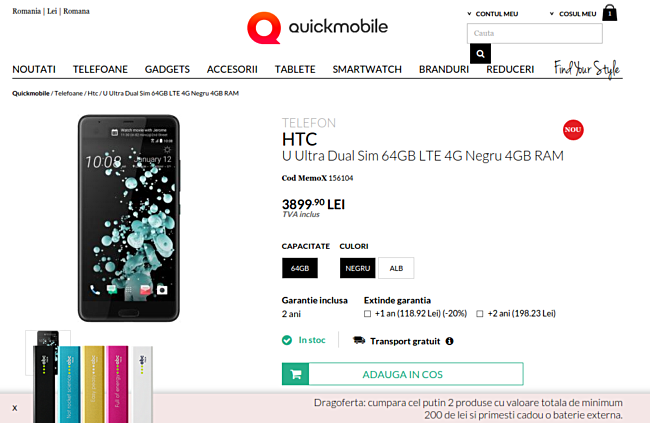 Romanian retailer QuickMobile has the 64GB variant listed for RON3,899.90, which translates to $910. The device is already up for pre-order in the UK (where the SIM-free model begins at £614.98), with shipments starting March 1. Over in the US, the phone costs $749 - you can place the order but shipments won't begin before mid-March. Thanks for the tip, Sabbin!! !